Integrate with Connect using webhooks to pass user-level events to your backend systems. Webhook integrations are not recommended for high volume applications. Processing time at the client can cause events to back up, resulting a significantly delayed event stream. Contact Airship Sales or Support for help scoping the right Connect integration to support your application. 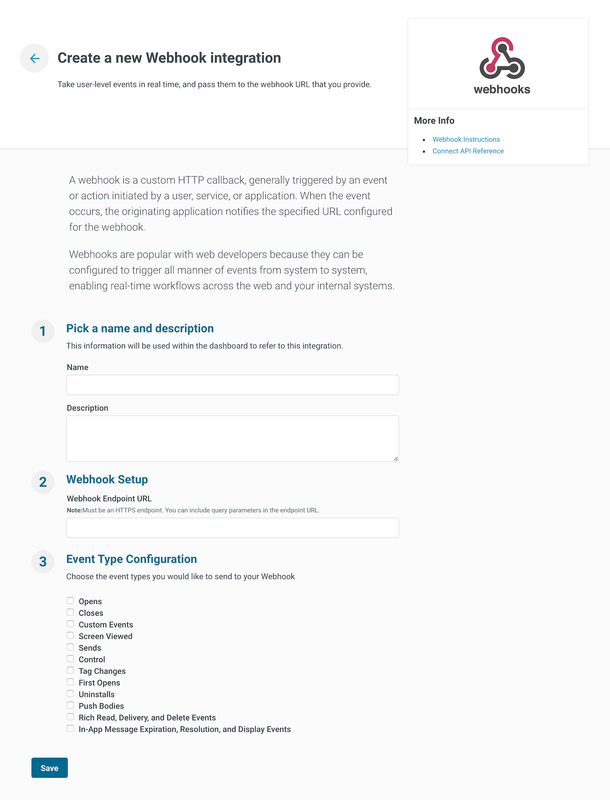 With webhooks, you tell us where to send the events by providing a URL, headers, and authorization info. With a direct connection, you control when you pull data from the raw data stream and filter the data according to the needs of the system that consumes it. A webhook is a custom HTTP callback, generally triggered by an event or action initiated by a user, service, or application. When the event occurs, the originating application notifies the specified URL configured for the webhook. Webhooks are popular with web developers because they can be configured to trigger all manner of events from system to system, enabling real-time workflows across the web and your internal systems. Open your project from the dashboard, click Settings, and select Connect Integrations. Enter the HTTPS endpoint URL you want your events POSTed to. The host must support HTTPS. Query parameters are supported in this field.